MLIC GRE® Prep Course Centers in USA, Canada, Worldwide. MLIC GRE prep is the best preparation you can get for GRE General Test because you will be trained in a structured GRE training, using LIVE GRE problems from recent GRE test administrations. Our best GRE prep courses are offered in the following centers in USA and Worldwide. (Click on your preferred GRE prep city to get more information). Location: Embassy Suites, Near Centennial Olympic Park, Marietta St., Atlanta, GA. When Offered: Twice each month, starting on Second and Fourth Fridays and ending on following Mondays. Schedule: Friday: 4 PM to 7 PM; Sat to Monday: 9:30 am to 6:00 pm. When offered: Once each month, starting on the Fourth Friday and ending on the following Monday. Location: MLIC Conference Center, 2500 South Highland Avenue, Ste 345, Lombard, IL 60148. When Offered: Twice each month, starting on the second and Fourth Fridays and ending on the following Mondays. Location: Embassy Suites, 2727 Stemmons Freeway, Dallas Market Center, Dallas. When offered: Once each month, starting on the Fourth Friday, and ending on following Monday. Location: Embassy Suites, Sage Boulevard, Houston Galleria, Houston. When Offered: Once each month, starting on the Third Friday, and ending on following Monday. Location: 118 E40 Street, New York NY 10016. When Offered: Three times each month, starting on the Second, Third, and Fourth Fridays, and ending on following Mondays. Location: Embassy Suites, 1776 Ben Franklin PKWY, Philly Center City, Near City Hall. When offered: Once each month, starting on the Second Friday, and ending on following Monday. When Offered: Once each month, starting on the Second Friday, and ending following Monday. When Offered: Once each month, starting on the First Friday, and ending on following Monday. When offered: Once each month, starting on Third Friday, and ending on following Monday. Schedule: Friday to Monday: 9:30 am to 5:00 pm. Location: University of British Columbia, 2329 West Mall, Vancouver, B.C. Location: 35 Craven Terrace, Lancaster Hall, London W2 3EL. A few blocks from Paddington Station. When offered: Twice each month, starting on the First and Third Fridays, and ending on following Mondays. Location: Berlin Marriott, Inge-Beisheim-Platz 1, 10785 Berlin. Location: Frankfurt Marriott, Hamburger Allee, Opp. Messe. When Offered: Once each month, starting on the Third Friday and ending on following Monday. When offered: Once each month, starting on the Second Friday and ending on following Monday. When offered: Once each month, starting on the Fourth Friday and ending on following Monday. Location: Jamnalal Bajaj Institute of Management, 164 Backbay Reclamation, Churchgate, Mumbai 400020. When Offered: Once each month, starting on the Second Friday and ending on the following Monday. Location: Hotel Marina Mandarin, Marina Square, Near SunTec City. Location: Mcquarie University Graduate School of Business, North Ryde, Sydney. Schedule: Friday to Monday: 09:30 am to 05:00 pm. The fee for the GRE Turboprep® courses offered in the USA and Canada is U$1,299. The fee in all overseas locations (England, Germany, Amsterdam, Barcelona, Paris, Dubai, Singapore, Hong Kong, Tokyo, Sydney) is U$1,695. GRE Prep Home, Structure, Why MLIC GRE is the best, etc. All MLIC GRE courses - Turboprep & Online prep - employ the best training methodology, best training materials, and best trainers. Use LIVE GRE questions. Read more. MLIC GRE prep courses require you to complete 120 hours of training in 3 distinct phases. Read more. MLIC GRE prep easily outclasses Kaplan GRE, Princeton Review, GRE, Powerscore, etc. MLIC offers the best preparation for GRE General Test. Read more. 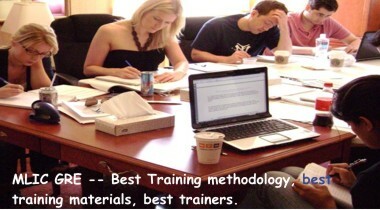 MLIC takes its training obligations seriously as revealed in the unsolicited testimonials. Read more. MLIC GRE Turboprep courses carry a fee of U$1,299 in U.S.A and Canada (HST will apply in Canada). The fee is U$1,695 in all European and Far East locations. Register Here. MLIC GRE Online prep course is the industry-leading prep option that includes LIVE GRE Virtual Classes hosted in real-time and for small groups of our trainees. Read more. See the Rankings for the Graduate Schools in the United States for the various types of Graduate Study programs. Read more. GRE® General test is a reasoning test that is required by most Graduate schools for admission to their programs in engineering, science, arts, and business. Lately, even some Graduate Business Schools such as Stanford and Harvard have announced that they will accept GRE® tests scores in lieu of GMAT® test scores for admission to their Graduate programs in Business Administration. Read more. ©2011MLI Consulting, Inc. New York NY 10163-1911. Tel:12126825000. | GRE® is the trademark of ETS® | Turboprep® is the trademark of MLIC Inc.